Believe it or not, I don't have an April Fool's Joke. I don't believe in them. It's for the amateurs around us. So while today is Amateur Day, I'll give you a little helpful hint. I enjoy videos. I watch an awful lot of them, probably more than I should. When I launch a web page and it has a video on it, that video should not automatically play. If it does, I am searching for a way to close that web page as fast as humanly possible. I usually do it while at least growling at the laptop, and most likely with a few "invectives". You know, four letter words. So if you are looking at Facebook, and I do this far too much to support the groups around here that I support, here is a way to make your life a bit easier. 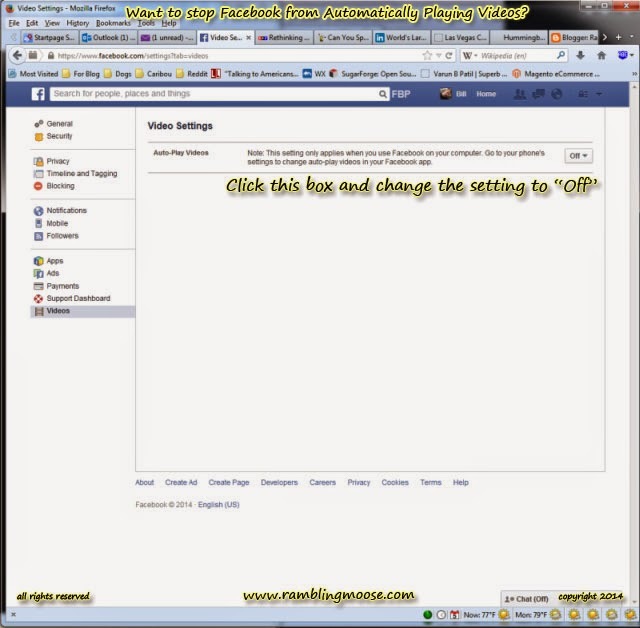 Click the "Settings" gear in the right side of the blue stripe at the top of your Facebook webpage. Lately that gear has been changed to a little subtle blue triangle, point down. The link is here to put you directly on the page. The resulting "General Settings" page has a list of settings you can work with in the left pane of the web page. Click on the Video Settings link on the left at the bottom of the list or just click on this link. Video Settings has only one thing you can set here, the Auto-Play setting. Click on the "On" or "Off" button to set it the way you like.